If you do not answer your messages, we may have to cancel your order. For non-personalized, non-custom orders - December 12th. 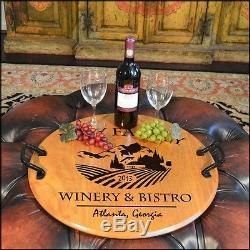 The item "Winery & Bistro Barrel Head Serving Tray withWrought Iron Handles, Home or Bar" is in sale since Saturday, October 08, 2016.